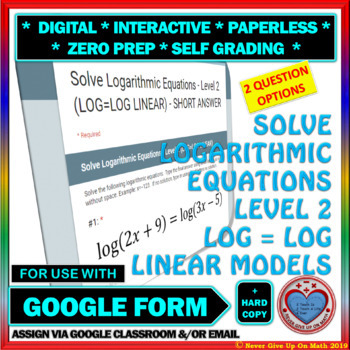 ✐ This 12 questions - (2 OPTIONS for Answers - 2 LINKS are included) product is a NO PREP & SELF GRADING 100% EDITABLE (EXCEPT FOR THE IMAGES) activity that will assess students understanding in how to Solve Logarithmic Equations Level 2 of Log = log with Linear inputs. 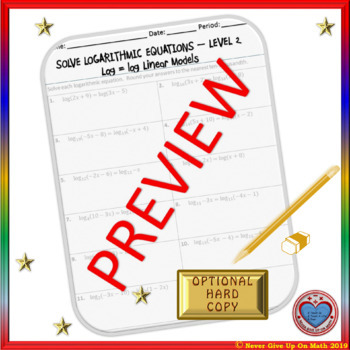 PLEASE NOTE: ONLY LOGARITHMS ARE USED IN THIS ACTIVITY. THERE ARE NO NATURAL LOGS. My Algebra II students have appreciated this quick quiz as it helped them to assess their understanding of solving logarithmic equations before taking a major assessment on the topic. An Optional Hard Copy is included in this product. 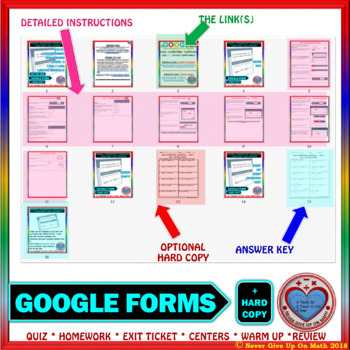 A suggested Step-by-Step Answer Key is included in this product. 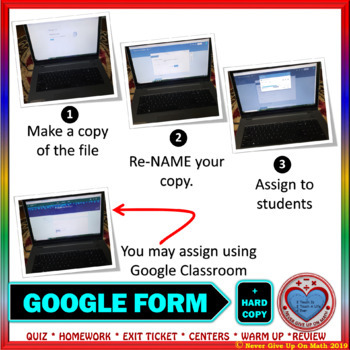 Please take a look at the preview and see the questions of this Google Form before purchasing.